We’re making zero waste toothpaste in the kitchen of Meryl Pritchard of Kore Kitchen. She’s using an olive wood spoon made from branches; no trees were cut down in the name of the spoon. She uses aloe instead of Bandaids. Her water jug is filled with spring water a friend delivers. Even her TP is made with wheat straw and requires no deforestation. “Why would we cut down trees so we can wipe our butts?” she asks me as she mixes the concoction of coconut oil, baking soda, turmeric, peppermint, and cinnamon. She scoops it into a glass jar for me to take home. What’s weird is how little I know about recycling; a blue bin is hardly a perfect solution. “Less than 10 percent of plastic that gets thrown in blue bins is recycled,” she explains. The reasons for this are multifold: people don't sort, rinse, or really know what can and cannot be recycled. “Feeling bad in your own skin is the single worst feeling." Kore Kitchen evolved naturally from this mindset. Kore is a “curated and nutritionally designed, meal delivery service and cleanse offering based in Los Angeles.” The intention is to help clients adapt a healthier lifestyle through simple nutritional philosophies: eat whole, organic foods, that are local and sustainably sourced. There's no packaging in her pantry. She fills reusable glass jars with foods from the bulk bins. She had a few clients during this time, but it was when friends and clients Donovan and Libby Leitch recommended her to Gwyneth Paltrow, the business took an unexpected turn. “I delivered her meals and heard nothing for a few months,” she says. Until Goop’s food editor reached out in December 2014, saying they loved her recipes and would she contribute a few to the site. She shared some recipes for Goop’s 2015 Detox Guide and the email floodgates opened. “It was just me with one pan, in this kitchen, and I had all these orders.” She hunkered down, found a chef, Anna Lagura, whom she met through a happenstance convo with her neighbors across the hall, and signed a lease for a commercial kitchen space. Anna and Meryl now work out of L.A. Prep. Of Anna, Meryl says, “She’s the person I’m most inspired by. I can send her a photo of any dish and she can make it with our philosophy. And she knows all of the clients and their food preferences by name and memory.” The meals Kore offers are organic and made from local ingredients whenever possible. They use no processed foods, no additives, no antibiotics or hormones, no preservatives, and no refined cooking oils or refined sugars. They are 100% gluten-free and dairy-free. The business has been running for about a year and a half, and Meryl acknowledges the difficulties of being a self-funded, small business, but insists that she prefers it this way. "No funding required us to be more creative with our marketing," she says, adding "and I think we have a stronger connection to our clients." It’s also why they have partnered with LA Compost, a local compost with four hubs, one of which is five minus from the commercial kitchen space. “All of the food that you’re eating, the scraps are going directly to the compost. Not trucked out of the city and brought back to be sold as soil.” They also now have a plot at the Elysian Valley Community Garden where Meryl is trying out her green thumb. Click through the below gallery to see more of Meryl's zero waste lifestyle and see our toothpaste! The place where it all started. To her left, a zero-waste alkaline glass water jug. 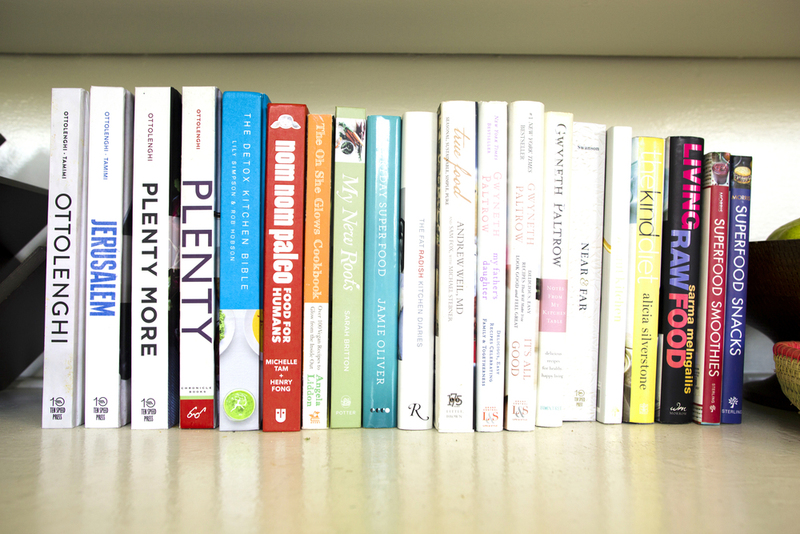 "The Kind Diet," by Alicia Silverstone is one of the books in her kitchen. "I'm so much happier now," says Meryl. Beans from the farmer's market, brought home in a linen bag. She uses a vitamin C shower filter that you can turn off with the click of a button to the right of the shower head. Meryl and her trash of three months. "I did a trash cleanse," she says, "and got rid of all of the packaging in my house."